For the second edition of Archsharing Competition we really wanted to explore opportunities to turn submissions into actual construction. For this purpose we made a partnership with the NGO Rock’n Wood. 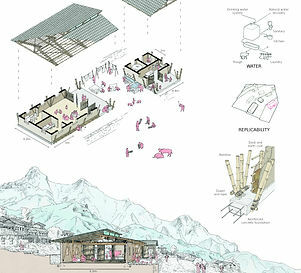 Together we felt that a community centre in a rural area in Nepal was an excellent match with the ethical and aesthetical aspirations of our younger generation. After the massive destruction caused by the 2015 earthquake, many NGOs came in for emergency support. Two years after, the mains NGOs are leaving to other assignments, but the damage is still present. Our partner Rock’n Wood is there for long term projects, such as schools, orphanages or community centers. The vision is that of a versatile infrastructure improving daily life : community room, atelier, kitchen, media/cultural space, shower and toilets. Architectural innovations and appropriate arrangements are key components for the vision, given the constraints imposed by the site, the use of local materials, seismic resistance, water and energy supply, waste treatment. 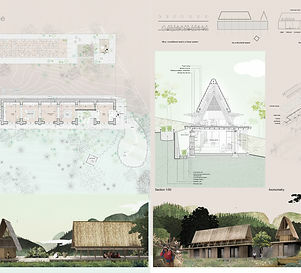 Very beautiful proposal with a very sensitive interpretation of the Nepalese architectural elements. The project adapts itself conscientiously to the natural ground and is well integrated into its environment (site, cultural context). 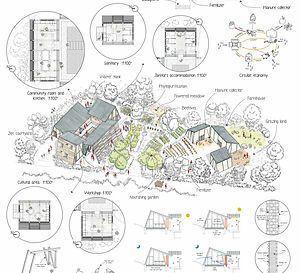 Its plan is simple, compact and intelligently designed. The work of distribution of the program and the orientation is well managed. The relation between the internal and outer spaces works very well. Spaces are carefully and ingenuity articulated around the central courtyard. The creation of a service extention is appreciated to separate the sanitaire from the main the building in accordance with local customs. The community room is highlighted by its relation with the patio and the view which it offers on the valley. The reflection on certain problems as the recovery of rainwater, waste water treatment or still energy was managed with simplicity. The form of the roof allows an effective rainwater collection, while stressing the sensation of interiority of the patio. The fabrics also participate in this system while giving a poetic touch to the project with a beautiful reinterpretation of the Buddhist flag. 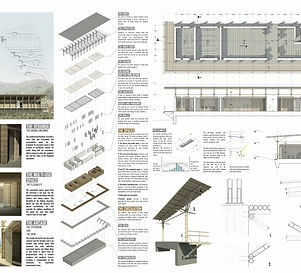 A very elegant work on details as for example on structure or systems of openings making reference to the local skills. The work on the light is remarkable! In a general way, the board is complete and offers all the informations necessary for the good understanding of the project. The graphism allows to project ownself easily in the building. 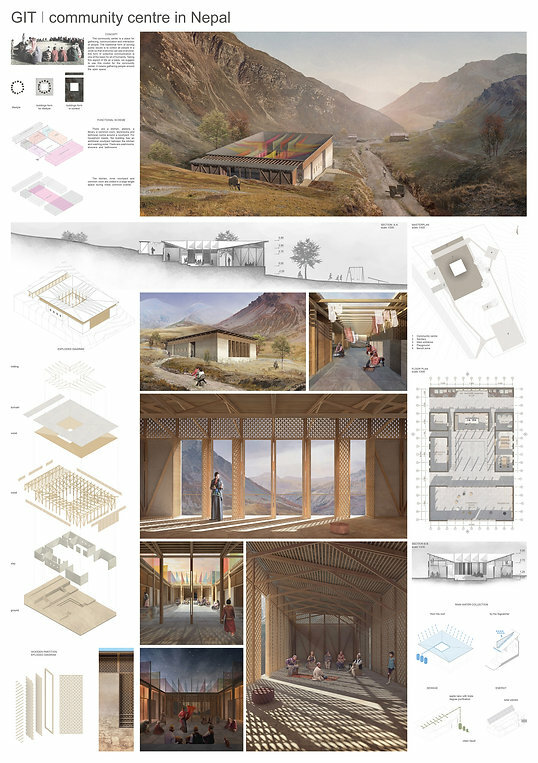 The members of the jury were particularly touched by the sensibility, the elegance as well as the good integration of the proposal in the Nepalese context. 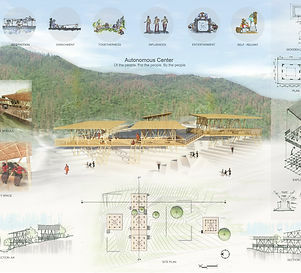 The good understanding of the concept of the community center was very well collected. Even if the project is a bit oversized for the communities with which Rock’n Wood work, this project presents all the characteristics which can lead to a constructed quality project. « We achieve simple ideas only after having exhausted all the complicated ones. » Constance of Théis; Pensées diverses (1835). 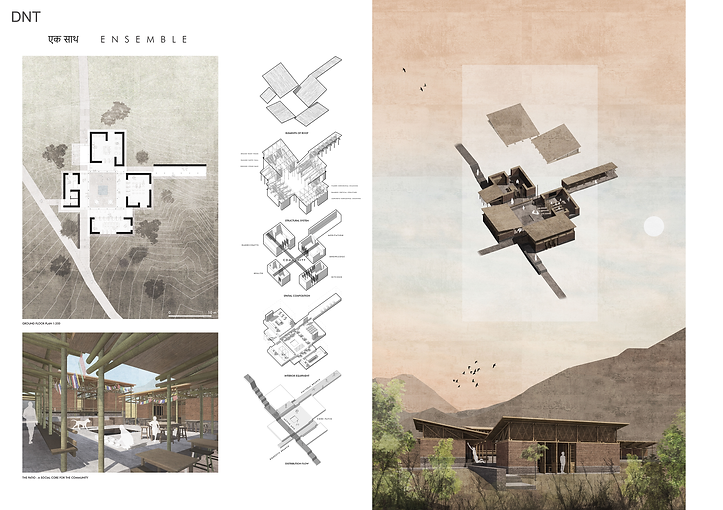 A simple concept with 4 functional volumes articulating around a patio and creating a coherent project. The composition of the plan allows a big flexibility of the various units while offering a big central convenient to the gathering of people. 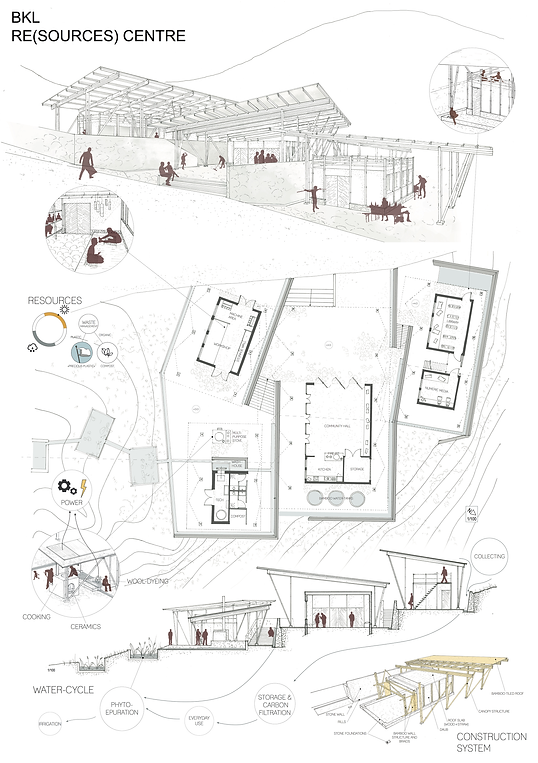 The distribution of the program and its rooms works very well for a community center. The work on the simplicity of the project is very interesting that it is of structural point (earthquake-resistant) or functional point (fluidity of the circulation). 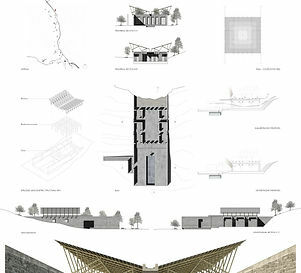 The sensibility of the research work on the local materials was very appreciated by the members of the jury. The use of a combination of various materials (stone, earth, Bamboo) is relevant and gives a big elegance to the project. 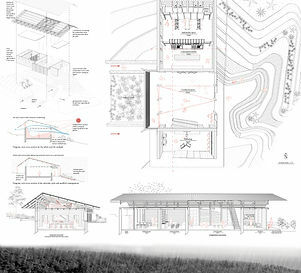 The roof gives certain bioclimatic qualities to the building for rainwater management and solar management. The patio gives numerous qualities to the project and the part covered with the péristyle runs one of these qualities by offering a wandering protected between the various internal spaces. 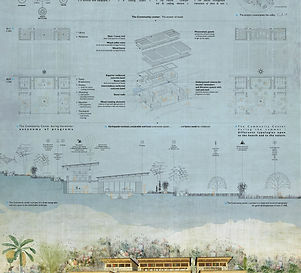 The concept of the project makes reference to the beginnings of the architecture. The shelter is its first function! 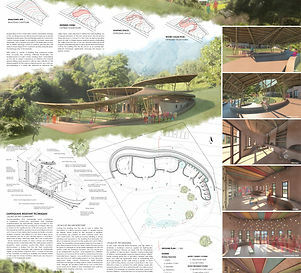 In this proposal, the roof is architecture. 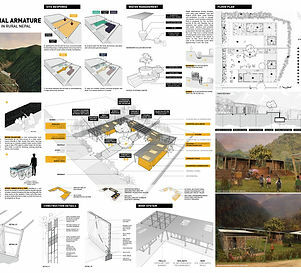 It allows the inhabitants to shelter, then to live in various spaces built with local materials. 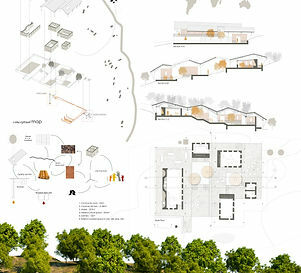 The proposal, simple and flexible, adapts itself perfectly to the site with its various excavations. Due to its form and its arrangement, the project can be built stage by stage. This phasing is very interesting in the Nepalese context. However, an important study would be to be made on the roof to adapt itself at best to weather conditions. The environmental approach of the project answers numerous problems of the subject as the water treatment, the energy … The sustainable aspect of the project is really impressive. All the resources are considered. This project brings very interesting techniques of construction. The simplicity of construction of the various blocks facilitates the learning (apprenticeship) of the local workers and the use of the local materials is in coherence with the local customs. More ever the integration of factory to the program, offer a possibility of an economic development very interesting. 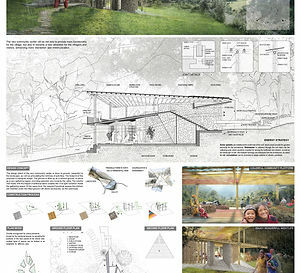 In a general way, the members of the jury appreciated the very adaptable concept and the simple constructive principle of the project which could be developed in various villages of Nepal. The environmental aspect of the project is also a key point which drew the attention and which shows the good intentions of the proposal.